From Kendal take the B6254 to Kirkby Lonsdale, a very handsome town on the River Lune. 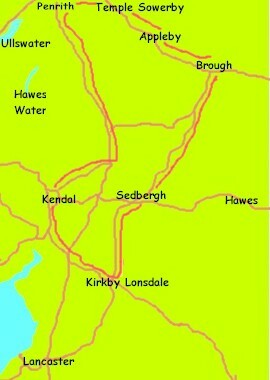 Take the A683 over the top of the fells to Kirkby Stephen, and then on to join the A66 at Brough. Make sure you detour from the main road to take in Appleby, Acorn Bank, Temple Sowerby and Penrith.